Background: Nowadays, peritendinous adhesions after flexor tendons surgery are still a formidable challenge. In this trial, we aim to assess the effects of oral and local tamoxifen administration in prevention of adhesions after flexor tendons surgery in rabbits. Material and Methods: This study was performed on 40 rabbits (10 animals in each group) underwent flexor tendon incision and then randomly subdivided into four groups. Exploratory incision was done after third postoperative day for macroscopic assessment of adhesions. 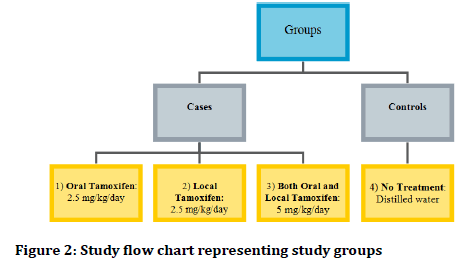 Finally, we compared the properties of oral and local routs of tamoxifen administration at 2.5 mg/kg/day or both of them with the control group 1. Results: Adhesion characteristic and adhesion tenacity score was measured as the last adhesion mark. The results showed that local tamoxifen was more effective than oral tamoxifen application in prevention of adhesion formation. Conclusion: Our present results confirm that local tamoxifen administration can reduce the postoperative flexor tendon adhesion scores significantly; thus it might have a great benefit in patient’s outcome after surgery. Nowadays, peritendinous adhesions after flexor tendons surgery are still a formidable challenge. There are several options for reducing peritendinous adhesions including post-operative rehabilitation therapy, modifications in surgical techniques, pharmacological drugs and mechanical barriers . Recently, the effect of ultrasound, electromagnetic and gene treatment, are also being discovered . Tamoxifen citrate is a mixed agonist/antagonist ligand for the estrogen receptor, widely used to breast cancer therapy . This drug has been shown to inhibit keloid fibroblast proliferation and decrease collagen production . Furthermore, it is approved by the food and drug administration (FDA) for managing of fibroproliferative diseases, like Riedel's thyroiditis, retroperitoneal fibrosis (Ormond's disease) and aggressive fibromatosis (AF or desmoid tumors) [4,5]. Although tamoxifen has been approved for above mentioned fibroproliferative diseases, it may have a little therapeutic effect on the some of them, such as primary sclerosing cholangitis (PSC) , chronic fibrotic kidney disease (CKD) , and sclerosing mediastinitis . Here, we hypothesized that tamoxifen through its antifibrotic activity might have a potential activity to prevent adhesions after flexor tendons therapy. Therefore in the present investigation we decided to assess the efficacy of oral and local tamoxifen administration in prevention of adhesions after flexor tendons surgery in rabbits. This present experimental investigation was carried out according to the ethical committee in Shaheed Beheshti University of Medical Sciences, Tehran, Iran (No. 1395/2541). The study was performed in accordance with the ethical standards of the 1964 Declaration of Helsinki and its later amendments. Totally 40 rabbits weighing 550 g to 700 g were randomly subdivided into four groups (10 rabbits in each group). All rabbits underwent flexor tendon incision after equal fasting period of four hours. Animals were anesthetized by receiving ketamine (60 mg/kg) and xylazine (5 mg/kg) as well as 1%–2% isofloran using the facial mask. 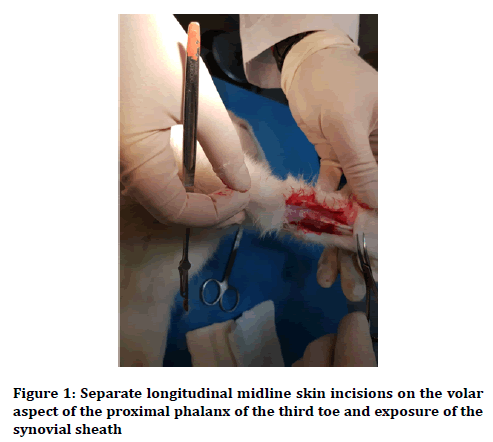 At first, the skin was shaved and disinfected, and then incisions in the separate longitudinal midline skin were made on the volar part of the proximal phalanx of each third toe of each front paw and cautiously dissected to contact the synovial sheath (Figure 1). Under magnification with a 4.0X Surgical Loup, the sheath was cut across between the A2 and A3 pulleys for evaluation of the flexor digitorum profundus (FDP) distal to the flexor digitorum superficialis (FDS) bifurcation. The medial aspect of the flexor tendon of the third toe of each front paw was completely divided at the proximal phalanges. Then A 6-O Nylon revised Kessler suture was located with the knot in the incision mid. After keeping the tendon sheath open, in the next step, the skin was sealed using separated 4-0 Nylon sutures. Finally, the organ was motionless by the wrist flexion, in a spherical cast above the elbow for 21 days. In group 1 (oral tamoxifen group), 2.5 mg/kg/day tamoxifen citrate was administered by oro-gastric gavage in postoperative phase; group 2 (local tamoxifen group) 2.5 mg/kg of tamoxifen citrate diluted in 10 ml of aquapura was injected into the wound immediately after closure of the tendon sheath; group 3 (both oral and local tamoxifen group) local administration of 2.5 mg/kg tamoxifen citrate diluted in 10 ml of aquapura, and then 2.5 mg/kg/day tamoxifen citrate was administered by orogastric gavage, postoperatively, in group 4 (control group), distilled water was used as placebo (Figure 2). Rabbits underwent exploratory incision after 21st postoperative day (the time of the cast removal) under general anesthesia using 50 mg/kg ketamine chloride. Adhesions were examined macroscopically (Figure 3). Grading of the adhesions was according to the Adhesion Characteristic and Adhesion Tenacity scoring system (Table 1) . Rabbits were then sacrificed by injecting a boundless dose of thiopental sodium into the heart. Data were analyzed using SPSS for Windows software version 22.0. The sum of two scores Adhesion Characteristic and Adhesion Tenacity score was considered as the final adhesion score and was compared between groups. The Kruskal–Wallis test was utilized to assess the dsifferences in the adhesion score between four groups. A Mann– Whitney-U statistical analysis was also used to determine the differences in adhesion score between four groups, separately. The p values less than 0.05 were considered statistically significant. Mean ranks of adhesion scores are presented in Table 2. The Kruskal–Wallis showed significant difference between adhesion scores across the groups (p=0.001). According to the obtained results, the mice in test groups 1-3 revealed statistically significant difference in comparison with the control group (p=0.002). Other results of comparison between groups, using Mann– Whitney-U test, showed that local tamoxifen (group 2) was more effective than group 1 with oral tamoxifen application for prevention of adhesion formation (p=0.004). Also, administration of both oral and local tamoxifen (group 3) reduced the adhesion scores significantly (p=0.003) in comparison with oral administration solely (group 1), but it demonstrated no statistically significant difference (p=0.472) with local tamoxifen alone (group 2). Here, we hypothesized that tamoxifen through its antifibrotic activity might have a potential activity to prevent adhesions after flexor tendons therapy. Thus in the present investigation we decided to assess the efficacy of oral and local tamoxifen administration in prevention of adhesions after flexor tendons surgery in rabbits. Postoperative adhesion formation results from a cascade of local processes at the trauma site, and may be considered as the pathological part of healing following injury. Tendons healing can proceed by two mechanisms: intrinsic or extrinsic. Intrinsic healing occurs within the tendon as a result of the activity of tenocytes and appropriate nutrition which is provided by synovial fluid diffusion and allows tendon healing without adhesion formation. Extrinsic healing occurs by the chemotaxis and proliferation of fibroblasts into the defect from the ends of the tendon sheath and usually leads to tendon healing with adhesion. Therefore, adhesions occur because of extrinsic healing of the tendon and limit tendon gliding within fibrous synovial sheaths [9,10]. There are two main strategies for preventing tendon adhesion: the management of damaged tissues and the application of biomaterials . A number of bioresorbable products, in the form of film or fluid, are widely used to prevent postoperative extrinsic healing pathway and the related adhesion formation. The products frequently used in clinic are polylactic acid film (a biodegradable and bioactive thermoplastic aliphatic polyester), Seprafilm (a film composed of chemically modified hyaluronic acid and carboxymethylcellulose), medical sodium hyaluronate, medical chitosan (a linear polysaccharide), Interceed (regenerated cellulose, used only in pelvic surgery) and so on . The use of hyaluronic acid in tendon healing decreased adhesion formation in vivo. But, even high molecular weight hyaluronic acid is rapidly eliminated. Thus, Seprafilm came into being by chemical modification of hyaluronic acid to increase its residence time . Seprafilm acts as a physical barrier preventing the formation of adhesions between opposing tissues while the natural process of tissue wound healing takes place . The effects of the hyaluronic acid in reducing peritendinous adhesion formation can be attributed to their inhibition of fibroblast proliferation and attachment. Hyaluronic acid derivatives such as Seprafilm do not support cell attachment, spreading, or proliferation, because of their negative charge, hydrophilicity, and lack of peptidic epitopes that activate integrins . However, Seprafilm can be difficult to handle during the surgery, especially when wrapping the tendon, because the material loses its integrity and strength during hydration. Findings of several experimental studies show that tamoxifen can be effective in prevention of postoperative adhesion in abdominopelvic cavity [3,16]. This hypothesis, however, has never been tested in humans . This research is designed based on our previous study  on the efficacy of tamoxifen on adhesion formation after abdominal surgery in guinea pigs. Our previous findings demonstrated the worth of tamoxifen in prevention of postoperative intra-abdominal adhesion formation. In this study, the efficacy of tamoxifen administration and its potential benefit in the prevention of adhesions formation after flexor tendons surgery was examined. Our present results are also agreed with the findings of this previous study  and the results confirm that both oral and local tamoxifen administration can reduce the postoperative flexor tendon adhesion scores significantly. Previous investigations also demonstrated that tamoxifen citrate is suitable to prevent the peritoneal fibrosis and postoperative intraabdominal adhesion; whereas its efficacy is dependent on the dose and route of application of this drug [19,20]. Regarding the toxicity of tamoxifen, previous studies have shown that this drug may result in oxidative liver damage and subsequently can cause be hepatocarcinogenic; therefore caution and attention must be considered in human subjects to use the proper doses and subsequently to minimize the side effects [21-25]. Based on the obtained results, the local route administration of the tamoxifen is significantly effective in preventing of adhesion after flexor tendons surgery. Since tendon injuries occurred most often in industry workers with poor compliance to therapies, thus intraoperative tamoxifen local administration might have a great benefit in patient’s outcome after surgery and also lower costs and post-surgical complications. Khanna A, Friel M, Gougoulias N, et al. Prevention of adhesions in surgery of the flexor tendons of the hand: what is the evidence? Br Med Bull 2009; 90:85-109. Otaghvar HA, Hosseini M, Tizmaghz A, et al. A review on metastatic breast cancer in Iran. Asian Pac J Trop Biomed 2015; 5:429-33. Karaca T, Gözalan AU, Yoldaş Ö, et al. Effects of tamoxifen citrate on postoperative intra-abdominal adhesion in a rat model. Int J Surg 2013; 11:68-72. Bonvalot S, Desai A, Coppola S, et al. The treatment of desmoid tumors: A stepwise clinical approach. Ann Oncol 2012; 23:158-66. Dellê H, Rocha JR, Cavaglieri RC, et al. Antifibrotic effect of tamoxifen in a model of progressive renal disease. J Am Soc Nephrol 2012; 23:37-48. Scapa E, Orda R. Primary sclerosing cholangitis (PSC) and tamoxifen. Int Hepatol Commu 1995; 4:149-52. Westerly BD, Johnson GB, Maldonado F, et al. Targeting B lymphocytes in progressive fibrosing mediastinitis. Am J Respir Crit Care 2014; 190:1069-71. Linsky CB, Diamond MP, Cunningham T, et al. Adhesion reduction in the rabbit uterine horn model using an absorbable barrier, TC-7. J Repro Med 1987; 32:17-20. Howell K, Chien C, Bell R, et al. Novel model of tendon regeneration reveals distinct cell mechanisms underlying regenerative and fibrotic tendon healing. Sci Rep 2017; 7:45238. Pauyo T, Herbst E, Fu FH, et al. Tendon healing. In Muscle and tendon injuries. Springer 2017; 45-50. Wu W, Cheng R, das Neves J, et al. Advances in biomaterials for preventing tissue adhesion. J Control Release 2017; 261:318-36. Lin LX, Yuan F, Zhang HH, et al. Evaluation of surgical anti-adhesion products to reduce postsurgical intra-abdominal adhesion formation in a rat model. PloS One 2017; 12:e0172088. Menderes A, Mola F, Tayfur V, et al. Prevention of peritendinous adhesions following flexor tendon injury with seprafilm. Ann Plast Surg 2004; 53:560-4. Diamond MP, Burns EL, Accomando B, et al. Seprafilm® adhesion barrier: (1) A review of preclinical, animal, and human investigational studies. Gynecological Surg 2012; 9:237-45. Liu Y, Skardal A, Shu XZ, et al. Prevention of peritendinous adhesions using a hyaluronan‐derived hydrogel film following partial‐thickness flexor tendon injury. J Orthop Res 2008; 26:562-9. Oner G, Ulug P. A systemic review of randomized controlled studies about prevention with pharmacologic agents of adhesion formation in the rat uterine horn model. Arch Med Sci 2015; 11:274. Pados G, Venetis CA, Almaloglou K, et al. Prevention of intra-peritoneal adhesions in gynaecological surgery: Theory and evidence. Reprod Biomed Online 2010; 21:290-303. Soleymanzadeh P, Mirzaei R, Mahjoubi B, et al. Tamoxifen for the prevention of postoperative intra-abdominal adhesions. Eur Surg 2015; 47:65-9. Mohamed AO, Kamar N, Nogier MB, et al. Tamoxifen therapy in kidney-transplant patients presenting with severe encapsulating peritoneal sclerosis after treatment for acute humoral rejection. Exp Clin Transplant 2009; 7:164-7. Loureiro J, Sandoval P, del Peso G, et al. Tamoxifen ameliorates peritoneal membrane damage by blocking mesothelial to mesenchymal transition in peritoneal dialysis. PloS One 2013; 8:e61165. Hard GC, Iatropoulos MJ, Jordan K, et al. Major difference in the hepatocarcinogenicity and DNA adduct forming ability between toremifene and tamoxifen in female Crl: CD (BR) rats. Cancer Res 1993; 53:4534-41. Athoupa M, Hirsimaki P, Parssinen R, et al. Alterations of drug metabolizing and antioxidant enzyme activities during tamoxifen-induced hepatocarcinogenesis in rats. Carcinogenesis 1994; 15:863-8. Kärki A, Mäntylä E, Hirsimäki Y, et al. Comparison of the effects of tamoxifen and toremifene on rat hepatocarcinogenesis. Arch Toxicol 2000; 74:249-56. El-Beshbishy HA. The effect of dimethyl dimethoxy biphenyl dicarboxylate (DDB) against tamoxifen-induced liver injury in rats: DDB use is curative or protective. BMB Rep 2005; 38:300-6. Desai PB, Nallani SC, Sane RS, et al. Induction of cytochrome P450 3A4 in primary human hepatocytes and activation of the human pregnane X receptor by tamoxifen and 4-hydroxytamoxifen. Drug Metab Dispos 2002; 30:608-12. Citation: Seyed Mehdi Moosavizadeh, Masoud Yavari, Seyed Esmail Hassanpour, Pajva Soleimanzadeh, Mostafa Alavi, Hormoz Mahmoudvand*, The use of tamoxifen in prevention of adhesions after flexor tendons surgery in rabbits, J Res Med Dent Sci, 2019, 7(1): 127-130.